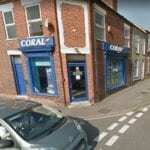 On this page you will be able to find out all the details you require for Coral 329 Nottingham Road, Ilkeston betting shop. Here you will find opening and closing times, location and more information about the area. Have a look at where Coral is located and make sure to make a note so you can visit when you want to place your next bet. Here you can see some photos of the shop which is located at 329 Nottingham Road in Ilkeston. 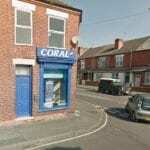 Coral 329 Nottingham Road Ilkeston is open Monday-Sunday. 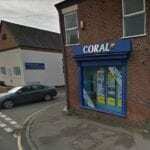 Coral is a licensed bookmaker shop situated at 329 Nottingham Road, Ilkeston. The license status: Grant by Erewash Borough Council as at 27/07/2010. The shop can be found on a street corner, making it easy to find for those who wish to bet on sports. Ilkeston is a town within the Borough of Erewash, in Derbyshire, England. It lies on the River Erewash, from which the local borough takes its name. Its population at the 2001 census was 37,550, increasing to 38,640 at the 2011 Census. Its major industries were traditionally coal mining, iron working and lace making/textiles, but these have all but disappeared in the last few decades. The town is close to both Derby and Nottingham and is near to the M1 motorway and the border with Nottinghamshire. Nottingham Road can be found situated in Ilkeston. On this road you can find a number of things including the Coral shop, Methodist Church and Asda. The eastern boundary of Ilkeston is only two miles from Nottingham’s western edge. Ilkeston is considered by the Office for National Statistics to be part of the Nottingham Urban Area. The town appears as Tilchestune in the Domesday Book when it was owned principally by Gilbert de Ghent. Gilbert also controlled nearby Shipley, West Hallam and Stanton by Dale. Ilkeston was created a borough by Queen Victoria in 1887. Ilkeston is one of several places where the distinctive dialect of East Midlands English is extensively spoken. Ilkeston also has a number of sports club including the Ilkeston Rugby Club. If you wish to place bets on things like rugby, make sure to visit our Coral betting site page or go to a Coral club nearby you.